PRESET COIL WITH SPECIFIC SPRING RATE PROVIDING LIFT WITH IMPROVED RIDE CHARACTERISTICS. 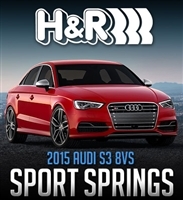 H&R has just released their Sport and Super Sport Spring kit for the 2015 Audi 8VS. H&R Sport Springs lower the vehicle center of gravity and reduce body roll for better handling. A lower wind resistance signature will make the vehicle more streamlined and improve gas mileage. H&R Special Springs are high quality products—they will not set or sag, they are designed and manufactured to be strong, resilient, and more durable than other automotive coil springs. All H&R springs are crafted from a special (hf) 54SiCr6 spring steel to ensure premium quality and performance.